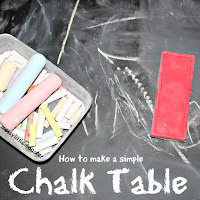 Are you looking for some easy rock painting ideas for kids? We have a really fun rock painting idea that doubles up as a feelings and emotions activity for toddlers and preschoolers (and older kids too!). 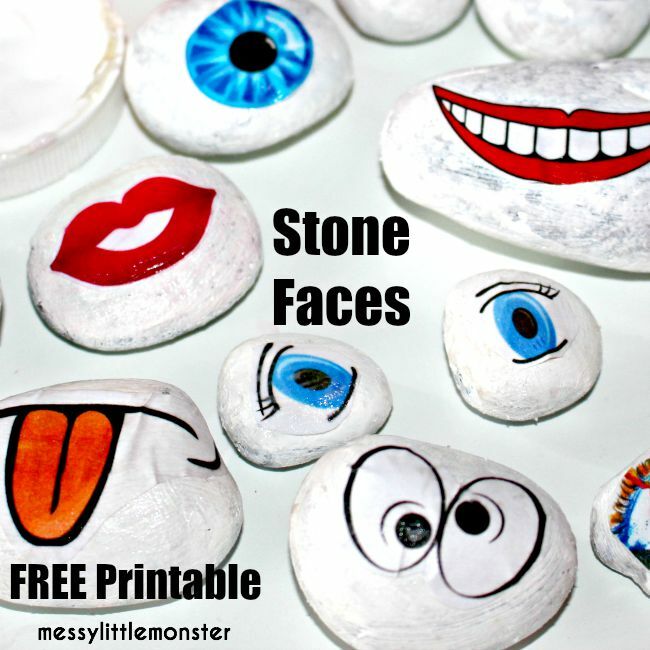 You can paint rocks using paint pens, acrylic paint or use our free facial features printable! 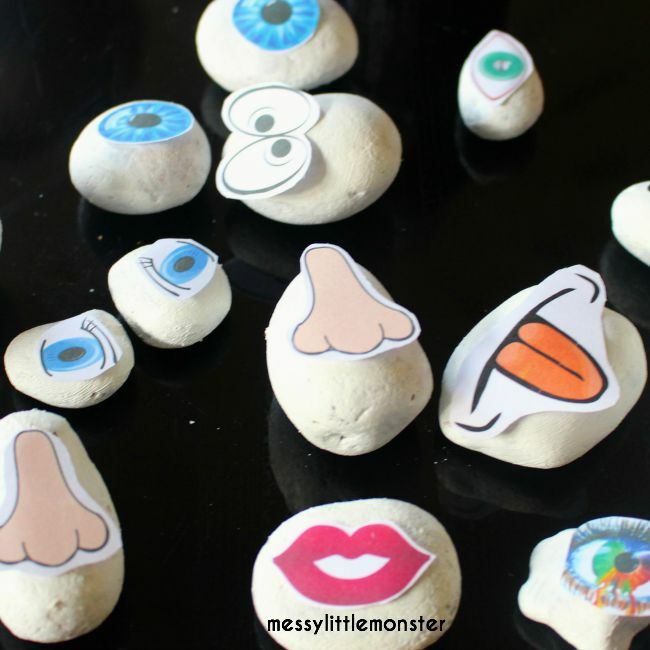 Once you have made a selection of facial feature rocks kids can have fun making funny faces using the rocks. Encouraging children to look at the facial features and expressions on each face is a great way of encouraging toddlers and preschoolers to talk about feelings and emotions. 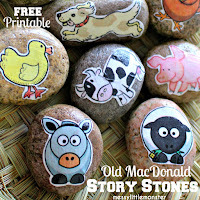 If you have a collection of rocks and stones and you are looking for more rock painting ideas take a look at our Old Mac Donald story stones and our rock fish. 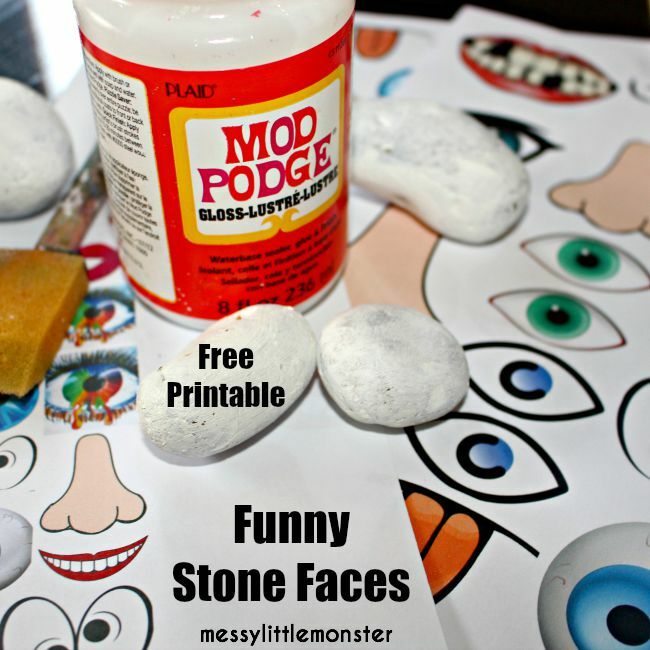 We have added step by step instructions for making your own DIY set of rocks using our free face parts printable. We have included a few different eyes, noses and mouths on the printable, including a few funny facial features. You could of course make a more personalised set of painted rocks by painting your own facial features onto your rocks using acrylic paint or acrylic paint pens. If you are looking to create these rocks as part of a feelings and emotions activity you may prefer to paint or draw directly onto your rocks so that you can include all the emotions that you want to dicuss within your painted rock set. FREE face parts printable (available to download at the bottom of the page). 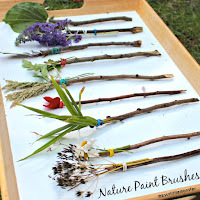 Alternatively you can use paint pens or acrylic paint. If you use paint pens or acrylic paint you will need to seal your rocks, you could use the mod podge listed above or a acrylic sealer spray. In order to make each of the facial features stand out on the rocks we decided we wanted to paint our stones white. You can miss out this step if you have white rocks or if you aren't worried about the background colour. The best paint for painted rocks is acrylic paint. Print off the face parts on our free printable and cut them out. We wanted to have the face parts in several different sizes so we could match them to the size of the rocks in our collection. To do this you will need to print them in several different sizes by changing the print settings on your computer. This step takes longer than you would think! Take a look at each facial feature and find a rock of a similar size and shape. Lay the face part on top of the rock and continue until you are happy that all the facial features that you have cut out are matched up with a rock. 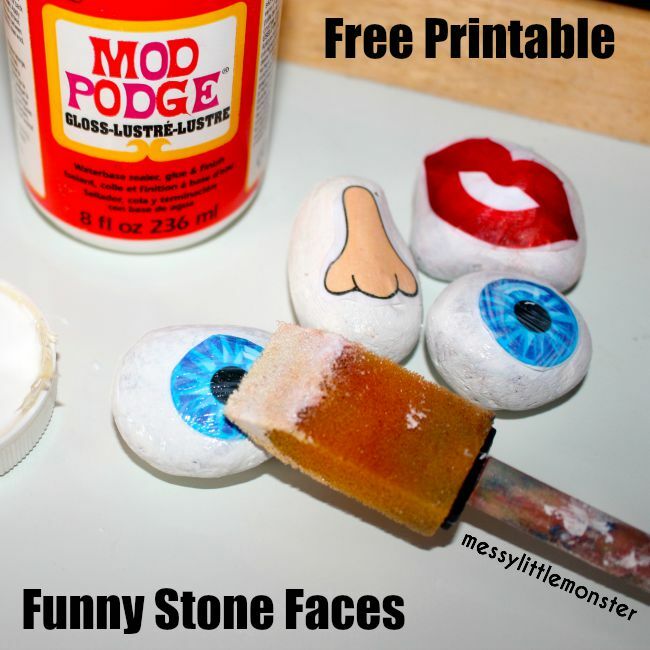 Put a splodge of mod podge glue on each rock and then lay the face part on top. Cover the face part with a layer of modge podge to keep it in place and protect it. 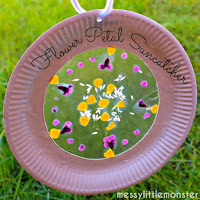 The mod podge acts as a varnish as well as a glue. You can either add the mod podge using a foam paint brush, or if you don't mind getting a bit messy we have found using a finger to smooth it into place actually works better than anything else. Leave the rocks to dry. Whether you followed our instructions for making feelings and emotions rocks using our free printable or whether you used acrylic paint pens or acrylic paint for this rock painting idea now it's time to play with them! 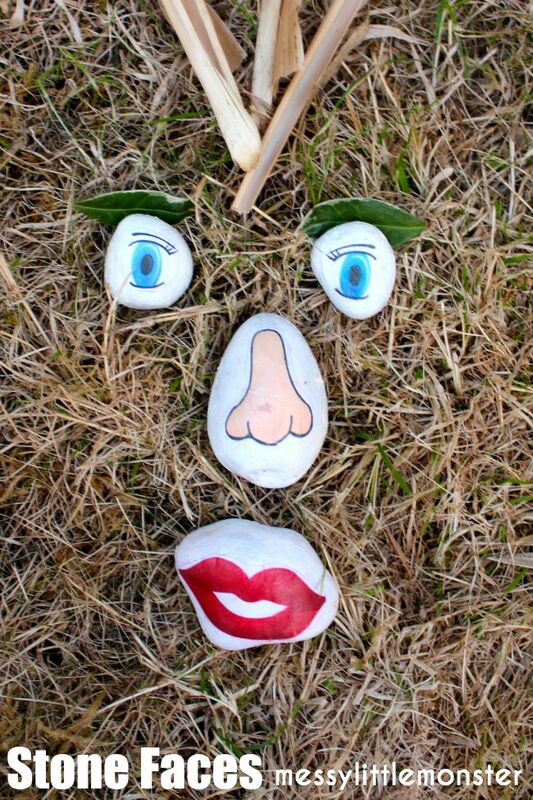 These face part rocks are so much fun to play with and taking them outside so that you can use nature as well as the rock face parts definitely adds to the fun. 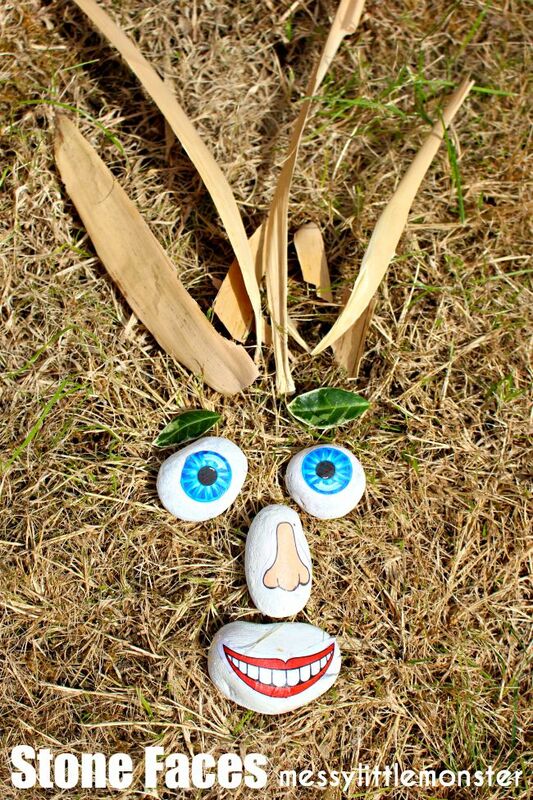 Kids will love this nature activity and when they are busy having fun making up silly faces using the rocks and nature it is the perfect opportunity to talk to them about the faces they have created. Is their face happy or sad? Why have they chosen a stone with a tongue sticking out? Does it make them laugh? Asking questions like this is a great way of getting children to open up about how they are feeling. If they make a happy face you could ask them what makes them happy or if they make a silly face you could ask them if they find it funny. 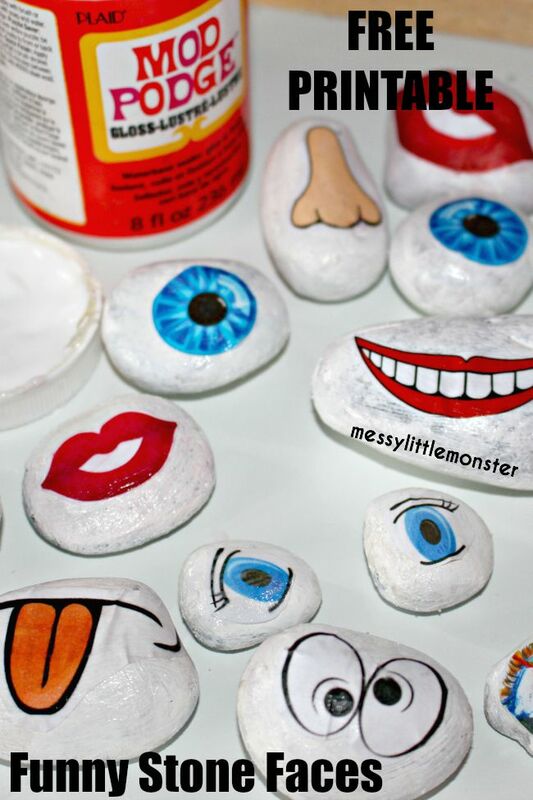 If you have made your own set of painted rocks using acrylic paint pens or acrylic paint you might want to add a few other emotions that you would like to discuss with your child, maybe a shocked mouth or some sad eyes. We would love to see what you make! 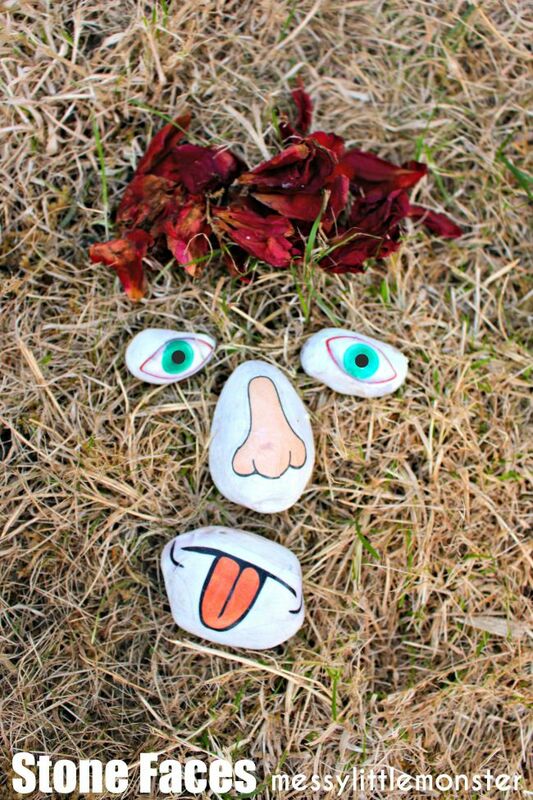 Here are a few of the funny faces we made with our face part stones and a few pieces of nature that we collected from around the garden. 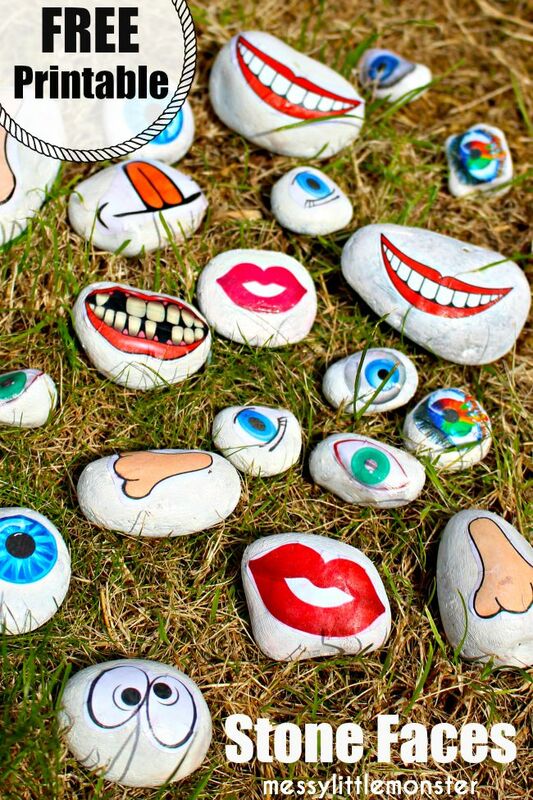 We hope that you have fun with this rock painting idea. 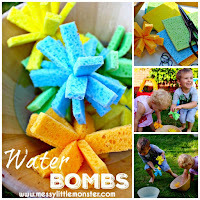 It is a perfect feelings and emotion activity for kids of all ages but especially for toddlers and preschoolers as it is so hands on and so much fun. 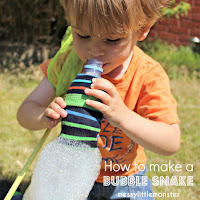 It is also a great summer activity for the kids to have fun and be creative in the garden. To download this face parts printable for free add $0 and click on the 'I want this' box below. It may take a moment for the page to load so please be patient.